WASHINGTON, Dec. 19, 2011 — Army Staff Sgt. Peter Wok­en was unique­ly hon­ored recent­ly for prov­ing that, in com­bat, it doesn’t mat­ter what lan­guages your allies speak, every sol­dier who fights along­side you is like a broth­er. The Ger­man gov­ern­ment high­light­ed that real­i­ty of war Dec. 8 when Ger­man Ambas­sador to the Unit­ed States Peter Ammon pre­sent­ed Wok­en with the Ger­man Medal of Hon­or for Gal­lantry in Action — an award sim­i­lar to the Amer­i­can Sil­ver Star. 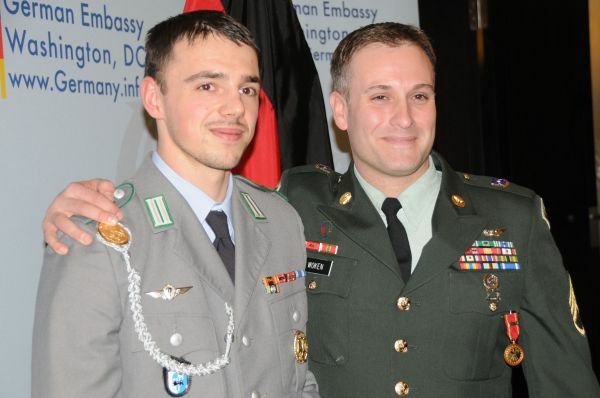 Address­ing the non­com­mis­sioned officer’s wife and two sons who attend­ed the cer­e­mo­ny, Ammon told the fam­i­ly an entire nation is thank­ful for Woken’s actions in Afghanistan which saved the life of Ger­man Cpl. Tim Fock­en. “The Ger­man gov­ern­ment and the Ger­man peo­ple are deeply grate­ful for your hus­band and your father,” Ammon said. Ammon pinned the medal on Woken’s uni­form. The sergeant, now part of the War­rior Tran­si­tion Unit at Fort Hood, Texas, is the first Amer­i­can to receive the medal on Amer­i­can soil. 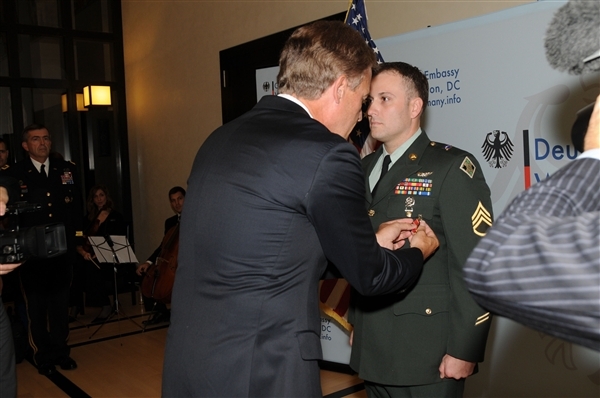 Sev­en oth­er U.S. sol­diers involved in sav­ing Focken’s life also received the medal, though it was pre­sent­ed to them in the­ater by Ger­man Defense Min­is­ter Thomas de Maiziï¿½re. Wok­en had said that he views the recog­ni­tion as con­fir­ma­tion of what sol­diers know about their com­rades — that sol­dier­ing togeth­er unites ser­vice­men across lan­guages and nation­al­i­ties. To an infantry­man, uni­form, lan­guage and nation­al­i­ty make no dif­fer­ence if you’re fight­ing on the same side, Fock­en said. Fock­en was shot Oct. 7, 2010 when his Ger­man ground patrol at Qala-ye Zai, Afghanistan, came under ene­my fire. After receiv­ing imme­di­ate med­ical assis­tance from Ger­man army medics, Fock­en board­ed an Amer­i­can Black Hawk heli­copter where flight medic Wok­en tend­ed to the injured soldier’s wounds dur­ing trav­el to a mil­i­tary hos­pi­tal. The action in Afghanistan that earned him the award was typ­i­cal of what com­bat medics are called upon to do as many as 10 times a day. Wok­en said he has per­formed so many res­cues that he’s lost count. The crew decid­ed quick­ly to land again to pick up the injured Ger­man sol­dier; per­son­al risk is not part of the equa­tion, he said, when you are try­ing to save somebody’s life. The Black Hawk stayed on the ground for less than a minute before Fock­en, who had been lead­ing a team of three sol­diers on the ground, was on board, Wok­en said. Fock­en was hit in the left shoul­der. He was able to main­tain order among his sol­diers even after he was shot, and his sol­diers applied aid to try to stop his bleed­ing. Once on the ground, a Ger­man medic tend­ed to his wound, and then he was able to get to the heli­copter. Both Wok­en and Fock­en were present at the cer­e­mo­ny — brought togeth­er for the event by the Ger­man gov­ern­ment. The two had not been in con­tact with each oth­er since Fock­en depart­ed Woken’s Black Hawk in Afghanistan in 2010. For Fock­en, he got a chance to say “thank you” to one of the Amer­i­can sol­diers that helped save his life. “It’s a great thing to say ‘thank you’ per­son­al­ly to Sergeant Wok­en and to his crew that saved me,” he said.